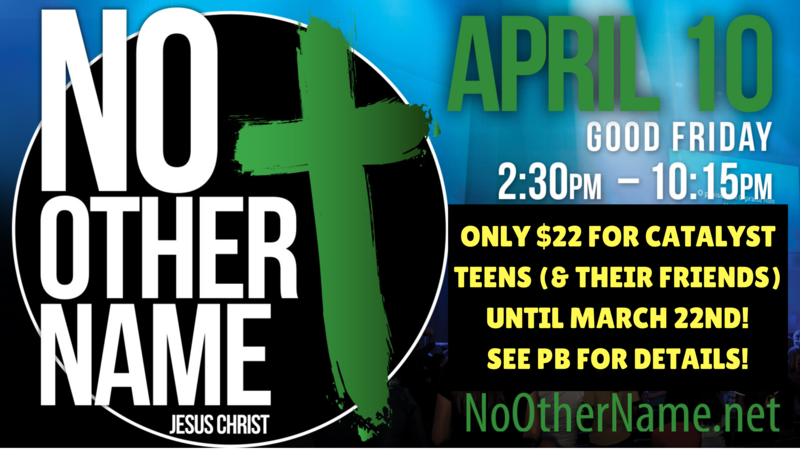 NO OTHER NAME is Ottawa’s annual Good Friday youth event that features great music, special speakers, cool workshops, the flea market of fun (inflatable jousting, obstacle courses etc…), and includes supper! We usually see 500-700 Ottawa teens participate each year! This year, No Other Name is happening on Good Friday, April 19th! The event is taking place at The Met Church from 2:30-10:15PM. I would really like to see as many of our teens as possible be a part of this event, so we're offering a reduced price to CATALYST teens. Early bird price is $32 per student, but we're offering it at $22 per student. That cost includes supper! This deal is only good before Friday, April 5th, so register early! You can get registration forms from Pastor Ben! You can pay by cheque (made to Arlington Woods Church), cash given to PB, or you can pay online below! If you would still like your teen to go but can't really afford the cost, talk to Pastor Ben and the church is able to subsidize! For additional information on Family Ministry events, see our bulletin or contact Pastor Ben Spears at ben@arlingtonwoods.ca.